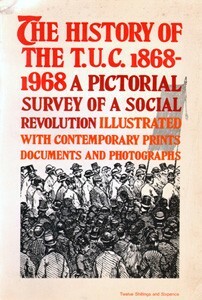 The History Of The T.U.C 1868 – 1968 A Pictorial Survey Of A Social Revolution Illustrated With Contemporary Prints Documents And Photographs. Cover is beige with red, burgundy and orange text. At the bottom is a pencil illustration of a large group of men, some carrying a banner. It states at the bottom of the page that the book cost Twelve Shillings and Sixpence.